For a transoceanic passage, the LST Mk 2 could carry one landing landing craft (LCT Mk 5 or LCT Mk 6) for side-launching, and this was a feature which was sometimes also used for the carriage of LCTs to the vicinity of an amphibious assault. In LST beaching operations, a satisfactory manner to bridge the gap between the forward edge of the ramp and the beach was not evolved until the ‘Husky’ landing on Sicily in July 1943; an operation which saw the introduction of pontoon causeways designed by a US naval officer, Captain John N. Laycock. Carried in sections on each side of the LST, these ‘roadways’, measuring between 75 and 140 ft (22.9 and 42.7 m) in length, were dropped just off the assault beach and then floated inshore to overlap, forming a shallow-water causeway of adjustable length and with the ability to ride the shore-line waves. When first used, these causeways had been towed in astern of LSTs, as indeed were LCT Mks 5 and 6 and other equipment when the situation dictated it, but as far as possible such cargoes were carried rather than towed because of the difficulties caused to the towing ship’s handling. The causeways were used in all the Allied theatres where amphibious operations were undertaken, although experiments with coconut log causeways were made in the early phases of the US Navy’s amphibious assaults in the Pacific theatre. It is worth noting that in that theatre, such as Operation Galvanic against Japanese-held islands in the Gilberts group (including Tarawa), LSTs carried multi-pontoon sections for floating jetties which were designed for assembly by US construction battalions into a pier alongside a reef. Two months later, at the ‘Shingle’ landing at Anzio in western Italy during January 1944, follow-on LSTs beached at the seaward edge of bulldozer-prepared mounds to supply the landed force with tonnages so great that for a short time Anzio could be rated as one of the largest ‘ports’ in the world: one of the problems which had to be overcome here was the fact that the disturbances caused by the LSTs’ propellers raised sandbanks which all types of landing craft and ships had to cross on the surge. The LST carried so much more cargo than the LCT that the process of unloading it took considerable time, even when the causeway was used. In the ‘Cherryblossom’ landing in Empress Augusta Bay on Bougainville island in the Solomons group during November 1943, for example, the LST was in the early stages of its use in the Pacific and South-West Pacific campaigns, loads of vehicles and cargo were as much as 1,400 tons, which was 200 tons more than the designed beaching load and double the average load: once the vehicles had been driven out of the LST onto the beach, the bulk cargo was offloaded by trucks, which had to be backed into the cargo space and then loaded by hand. This was a process which could consume as much as eight hours even with an average cargo. Many vehicles, and most especially the two-wheel drive British trucks used in operations such as the ‘Avalanche’ landing at Salerno on the west coast of Italy in September 1943, could not be driven quickly over the 1-ft (0.3-m) drop off an LST ramp even when plank extension ramps were used, so an unloading time of eight hours was deemed not to be unreasonable. Faster times were achieved by manhandling the stores ashore, and in the course of the ‘Postern’ landing of September 1943 at Finschhafen on the north-east coast of New Guinea, 100 men were carried to clear LSTs of an hourly average of 20 vehicles and 50 tons of bulk cargo. Experiments with other offloading concepts were undertaken: in one, a 50-ft (15.2-m) gap was left on the tank deck between cargo stowed aft and the other bulk cargo so that once the vehicles had landed from the tank deck, seven trucks at a time might be used for offloading in a process coordinated with the offloading of light vehicles from the vehicle deck. This allowed the process of cargo-handling to continue as these were driven ashore. A method of accelerating the cargo-landing process in order to meet the desired one-hour limit for discharging as LST was to preload trucks or trailers. This was trialled at Cape Torokina in Empress Augusta Bay but deemed to be only partially successful as the space taken by the vehicles seriously reduced the overall load capacity of LSTs of the second echelon. By 1945 the bulk cargo loads were often carried on pallets, with the LSTs each carrying specific stores and materials for amphibian vehicles (such as LVT tractors and DUKW trucks) to collect as though they were proceeding from bay to bay of a floating warehouse. Other LSTs were employed to carry the amphibian vehicles to the dropping zone, although as these exceeded the 10-ton vehicle weight limit for which the vehicle deck was stressed they had to be carried on weight-spreading chocks or in the tank hold. Vehicles of this type could be driven down the inboard ramp to offload through the tank deck, which was a process simpler than the use of the lift of early LSTs, which needed special maintenance and could simply become jammed. This latter required the LST with the jammed lift to proceed alongside another ship to drive vehicle-deck cargoes across to the other LST’s vehicle deck and thence its lift. During the ‘Detachment’ amphibious descent on Iwo Jima in 1945, in addition to their primary load of amphibian tractors, the LSTs carried the stores which would be required as soon as the assault waves of US Marines had gone ashore: these immediate-use stores included drinking water in vehicle-towed trailers, two ‘units of fire’ (ammunition) for each battalion, concertina wire; 2,000 C and K rations of pre-cooked wet and survival food, 1,200 D rations of alternative survival food, and petrol and lubricating oil. 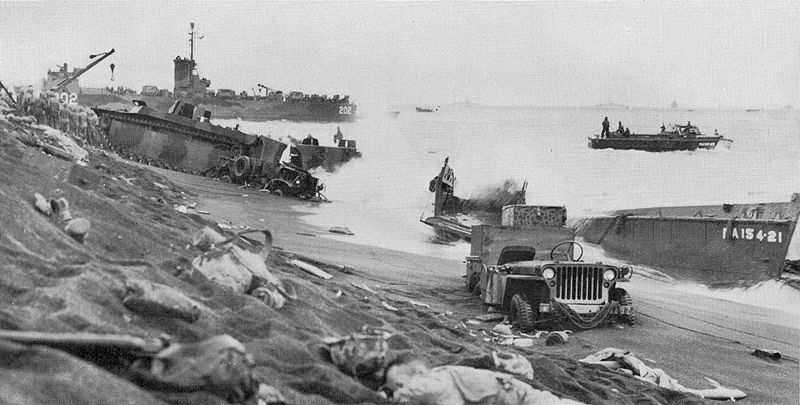 LSTs were also used to deliver a host of other equipment items needed as soon as the assault troops had a toehold on a beach: Marston perforated steel matting (8.5 miles [13.67 km] at Iwo Jima), four- and six-wheel drive trucks, vehicle service trailers, mobile cranes, bulldozers, and anti-aircraft guns. 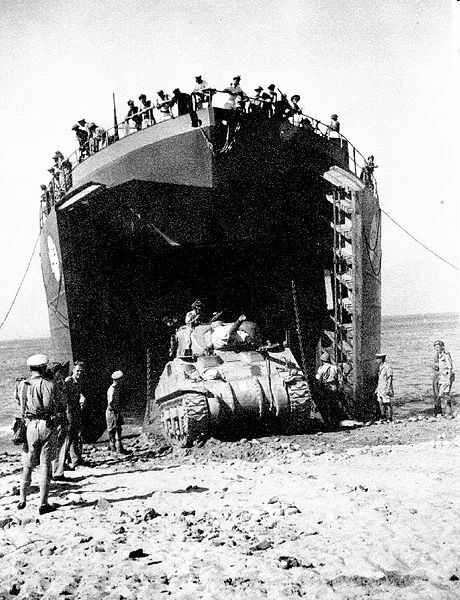 The amphibian tractors were the first vehicles to come ashore, and then trucks were loaded from the cargo hold in a sequence carefully pre-planned to ensure that the traffic was sent to different dumps and this caused no traffic jams of the type that were inevitably subjected to artillery attack. The entire scheme to offload the LSTs had to be created and finalised before the start of the operation so that the bulk cargo could be loaded and stowed in the right sequence to ensure the speediest possible tactical offloading. A typical LST load was 26 six-wheel drive trucks, six four-wheel drive trucks, four Jeeps, one four-wheel machine shop trailer, one 5-ton crane, two prime movers, two 40-mm Bofors anti-aircraft guns on their carriages, and ‘dead’ cargo in the forms of 115 tons of rations, 200 tons of fuel in drums, 40 tons of ammunition and 12 tons of ‘organic’ gear. This entire load had, of course, to be fully secured, as for any sea passage with chocks and chains to ensure that nothing could shift as the LST rolled and pitched. It is also worth noting that several LSTS were fitted with a short flight deck and Brodie landing gear to allow them to operate Stinson OY-1 light artillery spotter aircraft. 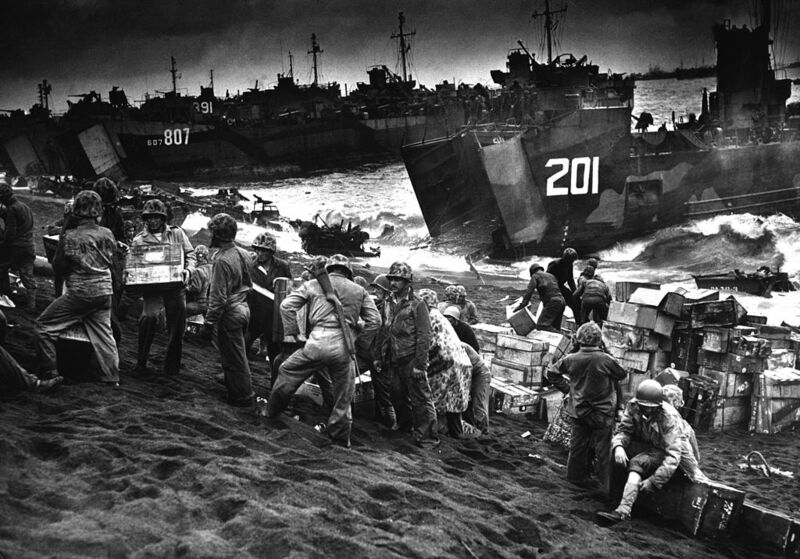 The general practice in many Pacific amphibious operations was for a specified number of LSTs, once unloaded, to remain off the assault beach for use as casualty clearing stations for wounded lifted from the assault beach before being passed farther offshore to hospital ships. In the North-West European theatre, moreover, several LSTs were outfitted with railway tracks so that they could deliver rolling stock to France, where a very large proportion of the national equipment had been destroyed by Allied air attacks to prevent its use by the Germans to reinforce their forces facing the Allied ‘Overlord’ invasion of June 1944.